If you have been pining over a 2014 Ford Mustang Cobra Jet drag car but you cant come up with the $100k or so needed to buy one of the 50 made, you might have another solution – as Ford Racing is now offering the heart of the 2014 Cobra Jet as a crate engine. 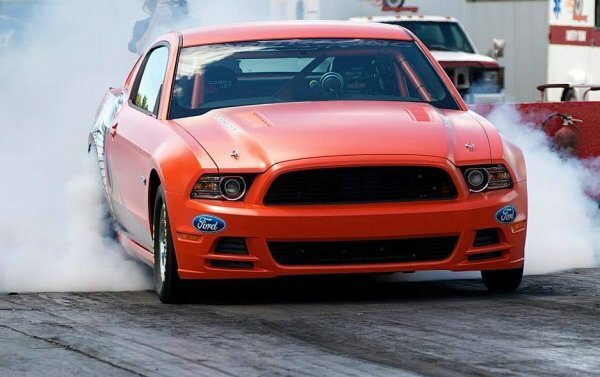 The 2014 Ford Mustang Cobra Jet is one of the most amazing Mustangs of all time but there are a few things wrong with the high performance drag racing package. First, it costs almost $100,000. Second, only 50 are made and sold each year. Third, Cobra Jet Mustangs aren’t street legal so even if you can come up with the $100,000 AND you manage to be one of the 50 lucky buyers – you can’t drive it on the street. However, with the addition of the 2014 Cobra Jet supercharged 5.0L V8 to the Ford Racing crate engine lineup, you can build your own Cobra Jet that can be street legal while being just as quick as the 50 factory Cobra Jet Mustangs. The 2014 Cobra Jet crate motor offers the exact same construction as the motors equipped in the 50 2014 Cobra Jet Mustangs which begins with an all aluminum 5.0L block topped with specially prepared Boss 302 cylinder heads, Boss 302 intake and exhaust camshafts, a ported intake manifold, a forge crankshaft, Mahle pistons, Manley connecting rods, a Whipple 2.9L supercharged and the rest of the components needed to make this motor roar. Ford Racing doesn’t specify the output of the Cobra Jet engine as those figures could vary based on the tuning and class being run but estimates suggest that this motor makes over 500 wheel horsepower and when you put this motor into the lightweight Cobra Jet Mustang with all of the other drag racing goodies like the wheels, suspension and transmission – it will rocket the pony car down the quarter mile in the low 8 second ET range. There is a bit of bad news with the 2014 Cobra Jet Mustang crate engine – it has a list price of $28,600 – so it isn’t what one would call a budget build option. However, if you own a late model Ford Mustang and you want to convert it into a street legal Mustang that is capable of running in the 8 second quarter mile range, this engine is your first step towards building yourself a street legal Cobra Jet. Ford Racing is only taking orders on this engine until October 31st 2013 so if you plan to buy one, you shouldn’t wait to order it as there is likely only a small batch of Cobra Jet 5.0s being produced in the near future. Of course, you might have a problem passing an emission test so if you live in an area where the government requires emission testing for street use – you might want to check the legality of this engine before making the move. It should also be noted that when you go to the trouble to buy the donor Mustang into which you will transplant the 2014 Cobra Jet V8 in addition to all of the other components needed to build a Mustang that will run with the Cobra Jet race cars, you are likely to spend far more than the price of the Cobra Jet Mustangs so the factory race car might be the better choice but if you just want to drop a motor into the modern Mustang that will make it very, very fast – head on over to Ford Racing before they have stopped taking orders on the 2014 Cobra Jet Mustang motor.